Sally Fitzgibbons is synonymous with surfing. Funnily though, she excelled at athletics, touch football and soccer in her teens. It's fair to say, if it required energy and sportsmanship, Sally was into it and mastering it. I had the pleasure of interviewing her for my iTunes podcast, Core Integrity With Cat, today. In light of her book, Summer Fit All Year Round, which I really enjoyed and am still referring to for recipes and body weight training ideas, I took the opportunity to ask Sally about how the book came to be, the role of athletes and authors in sharing their fitness and nutrition programs and how to do this responsibly. As you may suspect of an elite athlete, who rises at 5am to train and has a singular dedication to being the best she can be, Sally is an intelligent and articulate interview subject. She's also funny and energetic and inspiring. I may come to regret this, but I was so enthused by her I agreed to a trade of yoga training for a surf lesson. I fear I'll need more than one! Here's some recipes from Sally's book. I've posted them as downloadable PDF so you can print and paste up on the fridge! Yes, old school. From the outset, let me make clear that I don't follow any food regimen strictly and zealously nor do I advocate a restrictive approach to eating, movement or living at all. I believe - as I hope you will - that each of us needs to make choices that align with our values, our beliefs, our needs and our enjoyment and engagement with life. That means that your approach will likely differ over time and I've known many people who go from meat eaters to vegetarians and have periods of returning to seafood or meat if they feel their nutritional needs aren't being met sufficiently without it, or just because they want it and choose it. It's not for any of us to say what is right and wrong for anyone else - so this post is not advocating a dietary approach, rather it is looking at the importance of gut health to quality of life and the ideas and lessons we can take from each of these approaches and consider when preparing and sharing meals. I've been reading The Complete Gut Health Cookbook by Pete Evans and naturopath, Helen Padarin. While the book does strongly follow paleo guidelines to eating, there is a recurring reminder that these are suggestions and not a strict advocacy of one way to eat or live. Regardless of your preconceived ideas around Pete, his genuine desire to share a love of eating well and with awareness of how food affects overall health is contagiously joyful. The consistent message across paleo, vegan, raw food and plant based eating is that food is more than simply calories and fuel. Food has medicinal and spiritual value. Choosing to eat to truly nourish rather than just to curb the appetite reflects a greater commitment: choosing to live in a way that nourishes our selves and those around us. However, back to the gut. Many diseases and lifestyle-based illness including diabetes type 2, angina, leaky gut, obesity and metabolic syndrome are the result of eating diets high in processed foods, lacking in vital micronutrients (vitamins, minerals, enzymes) and the approach to eating food on the run, with little consideration for how important it is to sit down, savour and enjoy food as part of feeling genuinely satiated, nourished and allowing food to digest without the impediment of stress hormones creating a maelstrom of poor digestive consequences: bloating, indigestion, leaky gut, constipation etc. There's much research to show that gut health is intrinsically connected to brain health and the strength of the immune system and all other systems of the body. When you get a moment, have a look at this TED talk: Food for thought: How your belly controls your brain. Gut flora is a term that refers to the environment of bacteria within the gut which is highly sensitive to foods, environment, stress and overall fitness and health. The healthier and richer our gut flora, the more energy we have, the greater absorption of nutrients from food and the greater ability to CREATE nutrients. It also feeds the immune system, fending off disease and allergic responses as well as maintaining a fit metabolism and regulating weight. The most common and preventable factors that damage gut flora are continual use of NSAIDs (ibuprofen, over-the-counter and prescription pain killers and anti inflammatories), chemicals found in processed foods and commonly used in agriculture, household cleaners and beauty products, preservatives and food colourings and flavours, excess fructose and simple carbohydrate consumption, chronic stress and lack of sleep and routine sleep and meal times. Raw food - food not heated above 36 degrees - contains the richest source of nutrients and enzymes. These enzymes allow for foods to be digested without requiring the body to use up its own enzymes in trying to break down foods and extract micronutrients during the digestive process. With sufficient quantity and diversity of raw vegetables and plant-based foods (nuts, legumes, etc), these simple protein chains create complex chains of proteins that fuel the body adequately and ideally. It is common for vegans to be deficient in iron and B12 though and in these situations, it may be wise to supplement with the recommended daily dosage or with the assistance and advice of a nutritionist, dietitian or medical practitioner. There's so many places for great food and great vibes in Melbourne. If you're vegan, vegetarian, gluten, lactose intolerant, paleo, raw, any and all of the above or NONE of the above, you will find options that cater to you and do so with flavour, joy and generosity. Herewith, and I must confess I haven't tried all of them, are some great finds in Melbourne. Some I have dined at, some I am YET to dine in, but all of them come highly recommended by friends, colleagues and fellow Melburnians. I'm also going to give a shout-out to my raw food workshop on February 7 at Kotch Lane Cafe in St Kilda. For $45 you get a handbook, goodie bag of products, entry to a doorprize, hands-on raw food meal making, and the fun of being in a group of curious, inspired people. Good food, local produce. This relative new-comer is a haven of nutritious and yummy offerings located right near the South Melbourne market so you can dine and then be inspired to go and buy your own ingredients. OR you can walk in circles around the market to build up an appetite and then go nourish your body and soul. Visit Fed Up Project. Easy parking, yes please. This is a menu that doesn't turn into a novel, which is promising. Doing the menu options you offer WELL with fresh, carefully selected produce is worthy of respect. Pretty easy to park this end of Johnston Street, especially on weekdays. A brunch or lunch post yoga is easily catered to. I can vouch their coffee is excellent and George is a sucker for the turmeric latte here (I can vouch it LOOKS cool.) Visit Uncle & Jak. All day breakfast menu? Yes, please! Lunch available from 11am. There's meat for your carnivorously inclined friends and fam. There's some absolutely belly loving bounty on the menu here and like most things in Prahran, the venue is super chic. Environment is vital! Visit Fourth Chapter Cafe. This is a stalwart of Fitzroy and you simply must. Their raw food offering is genuinely divine. Raw Pad Thai, tacos, cheesecake. This is an offering that goes beyond superfood salads and proves raw food is creative, expansive and exciting. Visit Vegie Bar. I recently had the opportunity to interview Professor Margaret Morris, Head of Pharmacology at the University of New South Wales. She and her colleagues are involved in some extremely relevant and fascinating research into the role of the gut bacteria in regulating weight, mood, overall health and how this research might apply to treating obesity and major illness and disease. While there is still much to be discovered and investigated, there is also much to be excited about. Essentially, if you are eating a balanced, healthy diet rich in complex carbohydrates, unprocessed foods including plenty of veggies and fruit (organic is ideal!) and meats, fish, tofu, soy and legumes then you're setting up your guts and your body for optimum fitness, stable energy and mood and an overall more happy, healthy life. The good news is - though it takes time for change to show definite, measurable results in regards to weight, mood and wellbeing, it doesn't matter how old you are, how active you currently are or how often you dine on Krispy Kremes at this point. You can make small changes from today and see results over time and you can change your guts, you can change your whole life for the better. My interview with Margaret is a podcast on iTunes or free stream on Soundcloud. Cat: For those new to the term, what is the gut microbiota? The term refers to the suite of organisms that reside inside our gastrointestinal tract (gut). There are many bacteria in our intestine and colon, that number in the trillions. In fact the number of bacteria outnumber the number of cells in our body! Bacteria is usually a word associated with germs and dirtiness. Can you explain the role of bacteria in the gut and why the term “bacteria” is not referring only to the “bad” bacteria? The bacteria in our gut perform a wide range of functions, and in fact, they are required for a healthy gut. Some of the functions include- They are harvesting nutrients from food; vitamin production; maintaining a healthy lining of the inside gut wall; healthy immune function. How long have you been working in the field of gut microbiota and its role in health? I have been working on obesity for 20 years, focusing on how the brain regulates appetite (and what goes wrong in the face of unlimited palatable food) and more recently began to examine the changes in gut microbiota profile across a range of interesting experimental models that we have – so about 4 years. What are the most exciting studies you’ve been involved with lately and what do they show us about lifestyle choices affecting gut microbiota and overall health? We are very excited by our research in animals into the link between cafeteria diet induced changes in memory, and the effect on the gut microbiota. Consumption of an unhealthy diet (e.g. high in saturated fat, high sucrose, low in fibre) is associated with less diversity in the bacteria in the gut - so-called ‘dysbiosis’ - and we found that the reduction in cognitive function was linked to changes in certain types of bacteria. This means that in the future, we may be able to introduce the missing bacteria to improve cognition. What role does the gut bacteria play in regulating mood and could studies lead to better treatment of depression, psychiatric illness and sleep problems such as insomnia and apnoea? Could these studies also mean that there will be preventative approaches & holistic non-pharmacological interventions provided by the educational, government and healthcare industries in future? Evidence suggest that the composition of the gut microbiota is altered in people with mood disorders (although the issue of causality arises here). In terms of using knowledge about the gut microbiota to more effectively treat certain disorders, there is a precedent for this with some serious infections of the gut. I can refer your listeners to our piece in The Conversation. Other work of Pedersen et al, Nature 2016 has shown that the microbiota may be very relevant to insulin sensitivity, leading to the conclusion that ‘Our findings suggest that microbial targets may have the potential to diminish insulin resistance and reduce the incidence of common metabolic and cardiovascular disorders', so I think there will be future developments in this space. How is the medical and health industry (private and public) as well as government responding to your studies and conclusions around dietary, behavioural and lifestyle choices in overall health of children and adults? No formal responses from government - but interest from the scientific community. And we have funding to continue some of this work. Can you explain the link between the intestinal function and cognition and memory? What does this say about memory, learning and how it is related to diet? There are a range of studies demonstrating a link between a healthy diet and memory and learning. Many of these are observational - they study a large number of people and look for associations between diet and brain function. Some studies have shown that various food patterns are linked to poorer cognition, or greater cognitive decline over time. Clearly it is time-consuming and difficult to conduct this type of work - and showing a cause-effect relationship is challenging. However on balance, there does appear to be evidence for poor diet linking with poorer function, and possibly brain changes (e.g. smaller hippocampus). How does a high fibre diet affect the gut microbiota and what sort of foods are ideal to add or increase in the diet? Diets that are rich in plant fibre are generally good for the gut microbiota. Have studies into omega 3 (and healthy fats found in nuts, fish, avocado and seeds) shown to have a positive effect on hormones and the gut microbiota? Yes, omega 3 in the diet can influence the makeup of the gut microbiota, so this may explain some of the benefits of eating foods that are rich in omega 3. In humans there is evidence that low omega 3 is linked to increased risk of depression. See ‘Role of Omega-3 fatty acids in the etiology, treatment, and prevention of depression: Current status and future directions’ Robert K. McNamara; Journal of Nutrition & Intermediary Metabolism 5 (2016) 96e10. While highly processed carbohydrates such as those in white bread, donuts, chips and takeaway burgers are well known to be “unhealthy” choices, it is also unhealthy to cut whole food groups. As an active person, what carbohydrates are healthy choices for balancing the gut microbiota? Generally complex carbohydrates that are unprocessed are best – these include whole grains, oats and the like. Refined sugars are less helpful. In fact, we observed changes in gut biota and impaired memory in animals that are eating a healthy diet, but supplementing that with high sugar intake. Agreed that the importance of sharing meals and enjoying food is vital so the occasional donut or Tim Tams with the workmates should not be declined or denied! What role does the timing of meals have in regulating gut microbiota and how can people use this to their advantage? For example, many people skip breakfast or eat smaller lunches to excuse late night snacking. Not much know (I believe) regarding impact of meal timing on the microbiota – it is an interesting question. What current studies are under way and what do you hope to see as far as investment in this area from public and private government and health investors? We have a range of studies underway - for instance, we are interested in the effect of exercise on the gut microbiota (even in the face of an unhealthy diet) as well as the impact of probiotics on gut microbiota and memory. I know how to cook, prepare and serve delicious, nutritious meals. I can also talk macronutrients, energy, allergies, vitamins and minerals. In short, I'm not in the dark when it comes to food and how to look after myself. There are other reasons for using a meal delivery service. Experiencing injury or illness that can sap you of energy and the physical ability to get out and about to shop and then to do the preparations also. I am guilty of being caught in eating the same meals all the time because it's easy. I know exactly what I need to buy in advance, I know how long it takes me to prepare and I know I like it. Only, I get so bored and if I'm bored, so is my body! Variety - just as in the classes you do, the friends you have, the places you go - is fuel for the soul. The body also benefits in every way from a variety of flavours, nutrients and just the mental effect of discovering something different and inspiring. There's already some really great services that deliver around Australia, and there are new ones popping up every week. This is both fabulous and also overwhelming if you're not sure where to start or you've had a bad experience. I've used the following and I highly recommend them. None of them require contracts or an ongoing relationship. You can order a one-time-only delivery and never do so again if you want! This is for the person too busy to shop but not completely inept in the kitchen. This is for people who enjoy the preparation factor, but don't want to walk through supermarket aisles for the sake of a few meals. The box arrived for me on Tuesday morning (delivered silently in the very early hours of morning!) and had each meal packaged in a separate large paper bag. In the box, recipe cards that described the preparation of each meal including cooking and prep time. I was provided herbs, flavourings, raw ingredients and ultimately, I had to cook and prepare. The great thing about this is that I felt like I had control over the level of flavouring I could add, and I could be a little creative as far as presentation and making any little adjustments like changing the choice of herbs or adding different vegetables. I heartily recommend the chicken and fish meals as well as the superb Superfoods Veggie Bowl. I did add extra protein to this one but if you didn't, it's ideal for vegans and vegetarians. Kate Save is a clinical dietitian with a true passion for food and it shows in the delicious menu options she offers. She designs meals with a real focus on balanced amounts of protein, carbs, vitamins and micronutrients to ensure hormonal balance, weight control and VERY importantly, flavour. From frittata to curries, chunky soups, chia pods, protein ball snacks through to vegetarian friendly tofu dinners, there is no skimping on quality and yumminess. Kate has worked with eating disorders, obesity, diabetes, juveniles and adults in her clinical role of dietitian and it was this, combined with her genuine love for preparing healthful, flavourful foods, that acted as the catalyst to start her own business. She has raised her children on these same meals and it is imperative to her that they are well fed, nourished and loved. This comes across in the food that arrives on my doorstep. It is full of flavour, perfectly balanced for a fit and weight-conscious individual, and also full of love and soul. 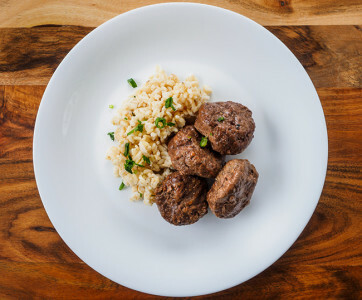 There is nothing dry and boring about Kate's meals and even though they are perfectly measured as far as macronutrients (safe for anyone looking to lose or maintain weight), there is nothing boring about Kate's menu. You can put in an order as late as Sunday evening and be assured of delivery the following Tuesday - everything is prepared and delivered fresh and clearly labelled. I totally recommend the chia puddings - in fact, I'd put in an order for these alone! - and the frittata with kale and chickpeas. Delicious. Definitely don't skip the Berry Bliss Chia Pudding and the Blueberry with Chia Seeds. I also loved the South American Chilli Beef And Beans for lunch on the go. My Muscle Chef was the very first meal delivery service I tried and it is not at all what I feared it might be: tiny portions of NASA-grade food for body sculptors who subsist on a couple of almonds and a lettuce leaf. THANKFULLY these are divinely tasty and the fact they are energy-controlled and designed with the ideal ratio of protein to carbs is an afterthought once you dig the fork in. The meals range from vegetarian through to kangaroo, fish, chicken and beef. I'm a big fan of the kangaroo with brown rice. It's so easy to overcook and dry out kangaroo meat but this is perfectly prepared and delivered for maximum flavour and texture. I admit, the meals are not nearly as big as I need for dinner. As a lunch option, perfectly portioned. I add nuts, extra rice and loads of vegetables to the dinner portion and occasionally, extra protein depending on my appetite. They deliver weekly to Melbourne and Sydney. Other delivery services I recommend trying include Aussie Farmers Direct, Woolworths Online and Nourished Life for supplements and healthy meal preparation tools.